You must have seen in Harry Potter movies when some letters gets teared apart and destroyed after the message has been conveyed, but it is no longer fiction as scientist have made special documents that when coated with a special layer of nano-particles would get erased by themselves when read once. A team at Northwestern University in Evanston, Illinois, coated gold nanoparticles with a layer of hair-like molecules called 4-(11-mercaptoundecanoxy)azobenzene or MUA. 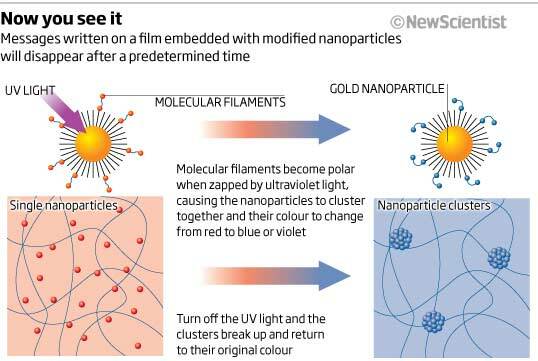 When zapped with ultraviolet light, these filaments change their shape and charge distribution, causing the nanoparticles to congregate together and change colour .